A persons brain activity was captured on an MRI scan as they imagined specific things. The data was then fed through into a ‘deep neural network’, which drew on a database of millions of images to produce corresponding patterns and visions. Is it this, or this? The machine keeps approximating and so, in turn, does the viewer - piecing together fragments and spasms of imagery. Temperature, light and movement all contribute to what is seen on the screen. 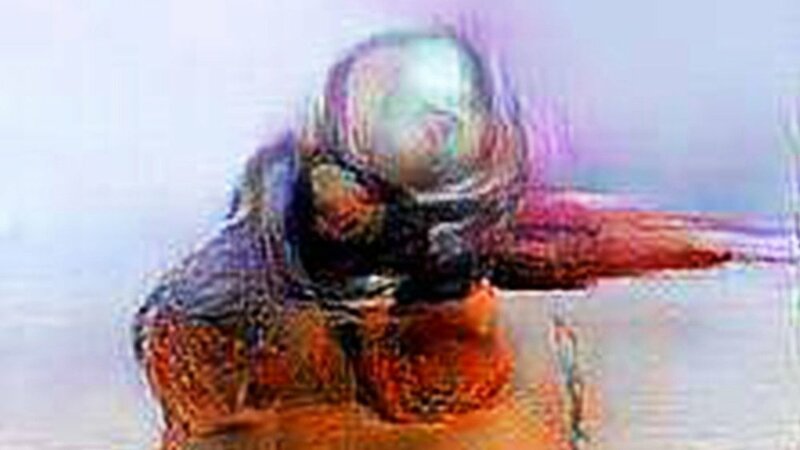 We are presented with a portrait of our mental picturing: a reflection, built from the workings of the mind's eye and the interface of the human brain and artificial intelligence. It is art that is ever changing and never twice the same. Before entering Uumwelt we were warned about the flies who had been “particularly active”. There is a ‘community’ of approximately 50,000 common blue bottles in the exhibition and some had found themselves into reception, onto magazines and implausibly inside glass cabinets. On entering the space, the flies were calm. Some buzzed around but most of them piled close to a circular window at the top of the room - a glimpse into a world they would never know. There were lots of flies on the floor, I saw flies on top of flies, some inevitably crushed and a surprising amount walking around. A utility of the flies was that they directed the attention to the dimly lit room, causing the viewer to integrate the dimensions of the space into the exhibition. It moved us inside the art as opposed to looking at it on a wall, making us participants in an interactive environment. In (what I thought was) an unconnected series of events: last weekend I had visited to a butterfly house with my family. The other night I dreamt about a baby parrot that was vomiting all over the place. I ran and held its convulsing body, disturbed, confused and barefoot in the kitchen. With that in mind, if I was asked to think about a fly, it is likely that these dreams and memories would all be in some way connected. Maybe the fly would grow butterfly wings, a beak or throw up to reflect this. It raises the question of whether a memory can ever be remembered identically. What does this say about reality? Certainly, A lasting impression of Uumwelt was a renewed intuition about how we perceive the connectivity and events in our lives. Inside our heads, these thoughts and moments become part of one weird transmogrified whole. A living organism, closer to a cuttlefish and than a library. The large panels in Uumwelt show the surface level abstractness of our mental imagery but also the rapidity of our minds. I didn’t see any single ‘thing’ or specific object. Instead, the images were truly amorphous, crazy and hypnotic. The forms glowing in the dimly lit chamber-like space were accompanied by the machine sound of the technology used to capture the brainwaves. The mood was somewhere in between sedate and sombre with the whirring and digital nature of the sounds framing the event both calmly and indifferently. 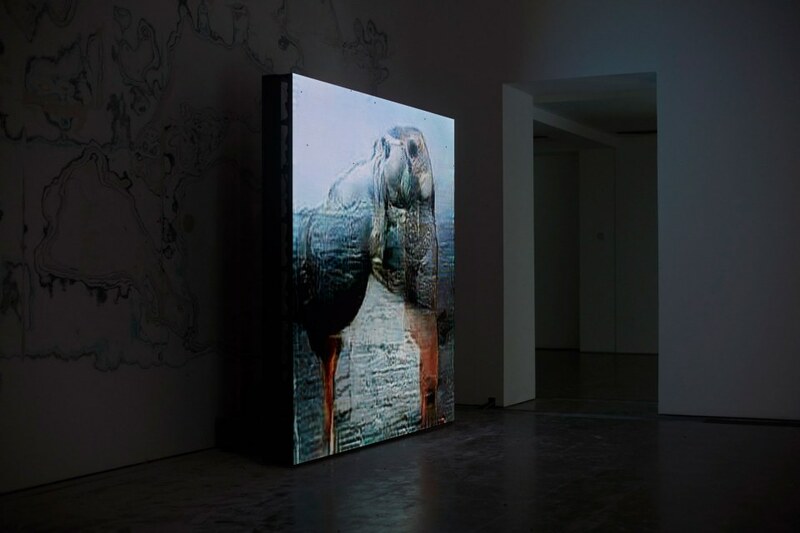 The reality of Piere Huyghe’s Uumwelt, which aptly means ‘the world as it is experienced by a particular organism’ is hard to conceive. Infinitely changing images created in partnership with a human brain interpreted by AI and influenced by the viewer's presence (whilst surrounding by thousands of flies) can feel like too much. Are we living in the future? Has it arrived and what is AI making art now?